The Mid-Back Cosm’s ergonomic design instantly responds to you, providing the balance and support you need, and a feeling of weightlessness that might make you forget you’re sitting in a chair at all. With dipped-in-colour, Cosm can come in one hue from top to bottom. Please be aware that due to unprecedented demand for this product, estimated delivery is from 20 to 90 working days – dependent on the finishes chosen. Sit in Cosm, and you just might forget you’re sitting in a chair at all. Its sophisticated ergonomic design sets a new bar for instant, personalised comfort, no matter who sat in the chair before you, how long you’ll be in it, or what you’ll be doing. The designers at Berlin-based Studio 7.5 knew, even when working on predecessors like Mirra, Setu, and Mirra 2, that the ideal chair would provide a smooth feeling of natural balance. A tilt is to a chair what a transmission is to a car, and like transmissions, some are manual, and others, such as Cosm’s, are automatic. With other self-adjusting models, the chair forces the body to conform to the tilt’s movement. Cosm’s Auto-Harmonic Tilt puts the person first and responds to them – no matter their posture – providing a balanced recline and personalised comfort. Studio 7.5 and Herman Miller perfected the self-adjusting tilt by inventing and engineering a complex, finely tuned mechanism. Accounting for the sitter’s vertical force, the gears within the tilt move the fulcrum along a leaf spring to automatically adjust the tilt’s tension. Available in three different back heights, Cosm gives you a new experience of comfort – anywhere you work. 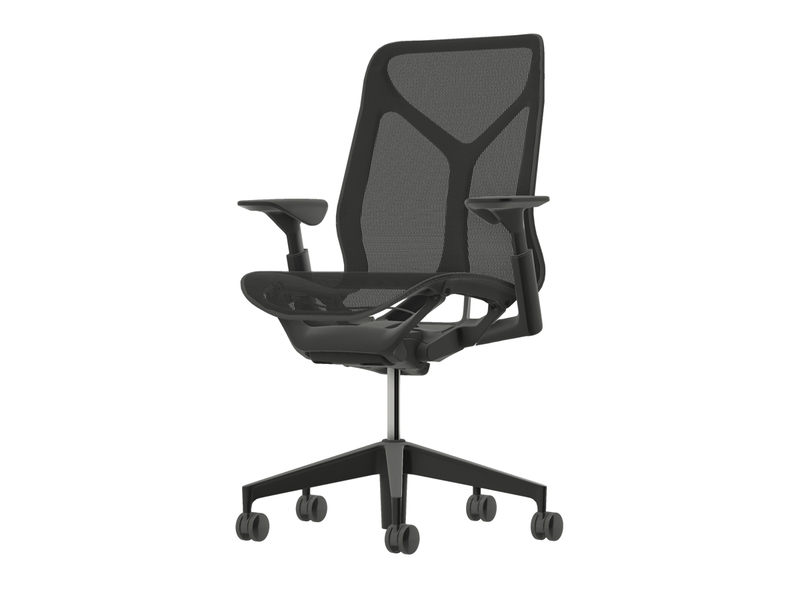 With regular care and maintenance, your Herman Miller Cosm chair will provide many years of superior performance and satisfaction. To maintain quality, please follow the cleaning procedures outlined here. For Water-based stains such as coffee, soft drinks, fruit juices, or milk, use a water-based cleaner (specifically made for cleaning fabric) or a solution of mild warm soapy water (not overly soapy) applied with a damp clean cloth or sponge. Work the cleaner into a lather or foam. Soak up all remaining solution and then use a clean cloth or sponge dipped in cool water to remove any residue. For oil-based stains such as lipstick, grease, or salad dressing, use a dry cleaning solution applied with a damp clean cloth or sponge. Test the cleaning solution on a small, concealed area first. If there is no spotting, ringing, or damage to the fabric or its dyes, apply the cleaning solution to the soiled area with light, quick strokes. Begin at the outside of the stain and work toward the center, being careful not to over-saturate the fabric. Do not over apply water or any liquid solution to fabric. Excessive wetting of the fabric with any liquid solution may result in permanent damage to the material. Do not rub too vigorously or you may damage the nap of the fabric or break fibres. Several light applications are better than one heavy application. Soak up all remaining solution and then use another clean cloth or sponge dipped in cool water to remove any residue. Let fabric dry thoroughly and then vacuum well before using. If the stain resists cleaning, contact a professional cleaner.